I’ve been mulling this over in my mind for awhile: with all we’re hearing about the evils of processed foods, how do I write something that explains that some of them are OK, and even a lifesaver for busy families? Today, I opened up my blog reader and discovered that I don’t have to. Words to Eat By (one of my favorite foodie blogs) did it for me. Debbie says it better than I could and includes a ton of great information. Go on over and visit her here. Show her a little love and leave a comment (g’head and tell her where you came from –*wink*). And then feel good about embracing some of the things in the inner aisles of the grocery store. No guilt, if you listen to what she says. Yesterday, I talked a bit about my cast iron pan. It’s a standard 10-inch pan with high sides and a handle–perfect for stovetop or oven use, and well-seasoned so that it’s just as nonstick as any Teflon-coated pan you might have in your cupboards. What I didn’t tell you is that I got my pan for the hefty price of $1 at a church yard sale years ago. It had been abandoned under a table in the church hall and was left there when most everything else had been picked over. Old and rusty and sad, it caught my eye nonetheless. And for $1, I figured if I brought it home and disaster ensued, I hadn’t broken the bank. Today, five or six years later, that pan is gorgeous. It’s heavy and distributes heat evenly, and then holds it for a long time, making it perfect for “brown food” (Ever watch Secrets of a Restaurant Chef? Ann Burrell? Brown food tastes GOOD!) Black and shiny with seasoning, and one of my favorite kitchen toys, especially for browning meat, caramelizing onions, or frying from time to time. And it really didn’t take much to get it there. If you’re lucky enough to find or inherit some old cast iron (or if you have a pan that needs some TLC), the first thing you want to do is give it a good wash with soap, water, and lots of elbow grease. This is the last time your pan will ever touch soap (if you love it, anyway), so make it a good one. Scrub until you can’t scrub anymore, and then rinse it well and let it dry all the way. This next part should happen outside on concrete if the weather is nice, in your garage or basement, or somewhere away from your kitchen. Grab a can of oven cleaner, a plastic trash bag, and your pan, and head to the place of choice. Spray your pan liberally with the cleaner and tie it in the trash bag, folding it over to keep the cleaner on the pan and as many fumes inside as you can. And walk away. Forget about it. Don’t peek. Don’t nudge at it. Just go. Give it a full 24 to 48 hours in the bag. Seriously. Trust me. At the end of that time, heat your oven to 300 degrees. Put the whole bag/pan shebang into a sink or near a hose and unwrap it (wear rubber gloves!). Rinse it off and scrub it down with the scrubby side of a kitchen sponge. DO NOT USE SOAP. We’re done with that. Dry it well and head back to your kitchen, where you’re going to coat the inside of the pan with Crisco, pop it into the oven, and leave it be for two or three hours. Finally, turn your oven off and let the pan cool completely. It’s going to stay hot for a long time–be patient. Wipe it out with paper towels and put it away. Congratulations–you’ve just brought a treasure back to life. When you cook in your pan, use oil or butter on the bottom–you won’t need much at all. After it’s finished cooking, let it cool and rinse it out with water, scrubbing away food with a scrubby sponge. Again, no soap! Use some table salt if you really need to scrub. Rinse it, dry it, coat it with a little vegetable oil (a very little bit–a dab on a paper towel), and put it away. My pan is several years old now and I skip that last veggie oil bit. I rinse, scrub, dry, and put it away. It’s seasoned enough that it maintains its wonderful nonstick coating. And now you know how to bring an old pan back from the dead. I hope you’ll try it! Half an hour to dinner and no idea what to feed the kids. Been there? I think we all have (and if you haven’t, just keep it to yourself; I love you but I don’t want to hear about it. Thanks.). It happened to me last night. DH and I had leftover chili, and I had no clue what to give my non-chili-eating children. They’ve been asking me for fish tacos for a few days. That would have been simple enough except that I had no limes in the house. Lemons either. Or guacamole or salsa. And we’re trying to eat through what’s in the fridge and freezer, so going out to get that stuff wasn’t high on my priority list, especially since I waited until a half-hour before dinner to think of it. But we did have plenty of rockfish in the freezer, and I remembered my mom’s chicken cutlets that my brother and I loved as kids, and it seemed simple enough to translate chicken to fish, and so I went for it. Old school in the kitchen, yo. The results? Huge hit. Huge. I swiped a bit myself and it was delicous. Just as I remembered–crunchy outside, moist inside, easy to eat with fingers or a fork, and simply yummy. The boy ate his with his fingers. The girl still wanted tacos, so I threw some into some taco shells and sprinkled cheese over top. I made these in my cast iron skillet, which I love for browning. It’s heavy and while it takes awhile to come up to heat, it stays hot for a long time and doesn’t fluctuate as food goes into it. If you don’t have cast iron, be sure your skillet is good and hot before you pop these babies in there–you want brown and crispy, and a cool pan will give you tan and mushy. Which is not at all what we’re going for. Heat a medium-sized skillet or cast iron pan over medium-high heat until it’s screaming hot. Don’t go nuts and crank the stove to high or you’ll have burned outside and raw inside, which is gross. Medium high. Break your eggs into a bowl and whisk them up. Pour the bread crumbs and cheese into another bowl and stir them together. Once your pan is hot, coat its bottom with olive oil and turn the heat down to medium. Coat each fish or chicken strip first with egg, and then with the breadcrumb mixture. Shake gently to get rid of excess crumbs. Plop it down in the oil and leave it alone for about three or four minutes, until the bottom is golden brown. Flip and cook the other side. My strips were on the thick side, so I then cooked each side on its own too. Remove to a plate that has two or three layers of paper towel on it. Let drain for a moment, and serve. I’ll tell you a secret. Every day at lunchtime, my laptop and my lunch and I head into our den and watch Barefoot Contessa while eating and returning emails. Today, Ina made baked eggs. And I have to tell you, I love me some Contessa, but BOY is her version way more complex than mine. Also way less healthy! We had a serious case of The Sicks last week, starting with a cold, morphing into an ear infection, and ending with vomiting and a low-grade fever. And then yesterday, I went to power up my computer to get a head start on work for the week…and nothing happened. Black screen. Dead logic board, said my heroes at the Apple Store. Three to five days to fix. I’m writing this on my kids’ laptop, which is many years old but still happy to serve me in weeks like this. They are not amused, but such is life. A comfort breakfast was called for. I had two soft and brown bananas calling to be used up, and we weren’t in a bread or muffin kind of mood. Waffles, though sounded tasty. And these were–crisp on the outside and fluffy and light on the inside with just a hint of banana throughout. A hit on all fronts. This started as a recipe that’s all over the Internet. As written there, it had too much oil for my taste, and a lot of white flour. I bumped up the banana, halved the oil, and used half wheat flour instead of all all-purpose. And they were really good. We have a big stack of them here, and many leftovers to hit the freezer for breakfast during the week. I’d show you a picture, but my camera and this computer aren’t playing nicely. They are tall and golden brown and yummy–trust me. In a large bowl, whisk together dry ingredients. Pour in the wet stuff, whisk everything together, and let it sit for 5 minutes (this lets the baking powder start to do its thing). Stir it once more, pour it on the waffle iron, and follow its directions to cook. It has been a heck of a week here in family-land. Colds and ear infections and sinus headaches, oh my! And deadlines that keep coming (thank goodness) and a traveling spouse and papers to sign, projects to finish, and everything else that keeps life with four people, a house, and a dog humming along. It’s been one of those weeks when I try not to sit down much, because if I sit for too long, my chin drops to my chest and I run the risk of dozing off right there. You’ve had them. We’ve all had them. And the result is that “optional” activities go out the window for a bit. Around here, that means less reading for me and less cooking from scratch. Yesterday, my daughter (ear infection kid) wanted something different for breakfast. I opened the pantry and spied a box of Jiffy corn muffin mix, which takes three minutes to stir together and 15 minutes to bake. 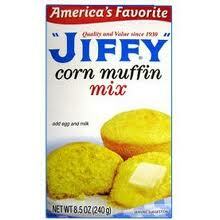 “Corn muffin?” I asked. She nodded. Done. Pour, mix, bake, cool, breakfast. They weren’t from scratch. Mrs. Cleaver doesn’t live here, at least not full-time. And that’s OK. They were delicious and hot and fresh and different, which satisfied my daughter’s need at that moment. They were easy and fast and involved one bowl and one muffin tin in the dishwasher, which met my requirements for another hurricane morning. And having something warm and toasty from the oven is super comforting, no matter how it got there. I love to play in my kitchen. It is, as we’ve said before, my zen and my happy place. But that doesn’t mean I don’t take help when I can get it, and take it with a little thank-you to the box that made it possible. Simple, easy, good. Rock on. A call for home-baked desserts for our school’s father-daughter dance went out about a week before the event, which was fantastic. I called dibs on a pan of blondies, bought the ingredients, and planned to bake them the morning they were to be dropped off. I’ve learned over the years to schedule that sort of thing in my calendar, or I’ll accidently book up the time with story interviews or writing and such, and the day filled up quickly around the baking date I’d set for myself. The day before, a reminder email came out. Along with a plea to ‘pink up’ our baked goods–make them girly and Valentine-y and beautiful. Fun! But…didn’t fit into my baking time, and there was little time for shopping for new ingredients. I had to run to the store Friday morning for something else, and my eye fell across a bag of pink and red Valentine’s M&Ms. Perfect. The candies went into my cart, the blondies were baked as planned, and life was grand again. I just substituted the Valentine’s chocolates for regular chocolate chips, which gave my blondies a nice pink and red top that the girls loved–my daughter reported that she visited the dessert table at the exact moment the last one was claimed by another girl. Improvising is a great skill to have in the kitchen, and it’ll save you a lot of time and worry as you perfect it. Think of recipes as loose guidelines rather than be-all, end-all formulas. Pay attention to ingredients–if this tastes and has a similar mouth feel as that, you can likely substitute one for the other with little ill effect. I’ve told you before that I frequently make dishes meant for beef, using chicken instead. Chicken has little taste on its own and a firm texture that stands up to all sorts of cooking methods, so it’s a great substitute in just about any recipe that calls for cow. It has a similar mouth feel and soaks up the flavor of whatever you cook it with. Versatile. Thinking of a chicken dish but have no fowl in the freezer? Try a white fish instead. Rockfish, cod, or halibut will often cook up just fine in a chicken dish (think chicken parmesan, lemon chicken…a dish that calls for pan-cooking or oven baking.). And sometimes you can reverse the above and use beef for chicken, if the sauce or marinate is strong enough. There are great ways to make other substitutions in recipes, too, if you forgot to pick something up at the store. Red and white wine are pretty interchangeable in dishes–the only downside is that red wine can sometimes turn a white-wine dish purple (which my kids think is the bomb, so play it up!). You can also use apple juice or chicken broth in a dish that calls for wine. A mixture of onion and garlic is a great substitute for shallots. Butter can stand in for shortening and vice-versa (tho I usually use less butter than I would shortening, or things can get greasy). White sugar stirred together with some molasses can substitute for brown sugar, and a tablespoon of vinegar mixed into regular milk makes a fantastic faux-buttermilk if you’re baking. Thinking outside the box can save you that extra trip to the store, which is key on our busy weekdays. I’d love to hear about your improvisations!